Pastitsio is a layered Greek pasta casserole dish, similar to Lasagne. In many parts of Greece and Cyprus, Pastitsio is also called “Makaronia tou Fournou” which means “oven baked pasta”. I have called this recipe Pastitsio the Greek way as opposed to the Makaronia tou Fournou, which is the one we make in Cyprus. The name pastitsio comes from the Italian “pasticcio”, where in some parts of Italy is also called “Lasagne al Forno”, which again means “oven baked Lasagne”. Lasagna are made with a flat sheet of pasta which has its roots in ancient Greece. This pasta was called “Laganon” or “Lasanon” or “Lasana”. Lasanon was a trivet or a stand for the pot. The ancient Romans named it “lasanum”. They cooked this pasta in the “lasagnum” which later was named affter this pot to Lasagna plural Lasagne. In Greece we still have un unleavened flatbread called “Lagana”. There are a few variations of Pastitsio throughout the regions of Greece with a few minor different spices but typically the bottom layer is bucatini or other tubular pasta with cheese and egg as a binder, or some of the béchamel cream. If we do not add the cream our pasta will not stick together but will spread in the plate during serving. The second layer is a ground meat sauce (usually beef or veal but it can also be substituted with pork, a mixture of veal and pork mince or chicken or turkey mince) with fresh tomatoes and cinnamon, nutmeg (cloves and allspice are a few other spices used). On top of the sauce there is another layer of pasta and on top of that is a thick creamy Béchamel sauce with myzithra or graviera (read here to find out about these Greek cheeses) grated and mixed in the pasta as well as in the béchamel sauce and some sprinkled on top together with a hint of nutmeg or other spices. See recipe and step by step instructions here. Sauté the onion and garlic until translucent. Add the ground meat and sauté until it turns white. Add wine and stir until it evaporates and add salt, pepper, allspice cinnamon and the bay leaf. Finally add tomatoes and tomato paste. Reduce heat and simmer until it is cooked and most of the juices are reduced to a thich sauce. Remove from the heat and mix in the parsley. (When the bechamel is ready add a heaped tablespoon of bechamel and mix). Meantime, prepare the béchamel sauce and pasta. Boil water and add some salt and cook the pasta al dente, according to the package instructions. Remove from the heat and place it in cold water. When ready to use drain and divide the pasta in two equal parts. Put half of it in the baking tin and mix in the egg white beaten, a few tablespoon béchamel sauce and some cheese and mix. Put the meat sauce on top and add the remaining pasta on top. Finally, add the béchamel sauce to cover pasta and sprinkle with some grated cheese and a sprinkle of nutmeg on top. Bake in a preheated oven to 180 degrees C / 350 F for about 45 minutes or until golden brown on top. Val, have you made the version you tried at Ioannina? I am curious to see what’s different. Ivy this is definitely my kind of food. Your Pastitsio looks so good!! It does look awesome and thanks for the tips as well. So glad you shared with Presto Pasta Nights. Yum Ivy – I love lasagna, so I am sure that this would be delicious. This looks great- I will try this myself. Reminiscent of mousaka (sp?) but without the eggplant I have to be in the right mood for. Hi Lauren, thanks for passing by. 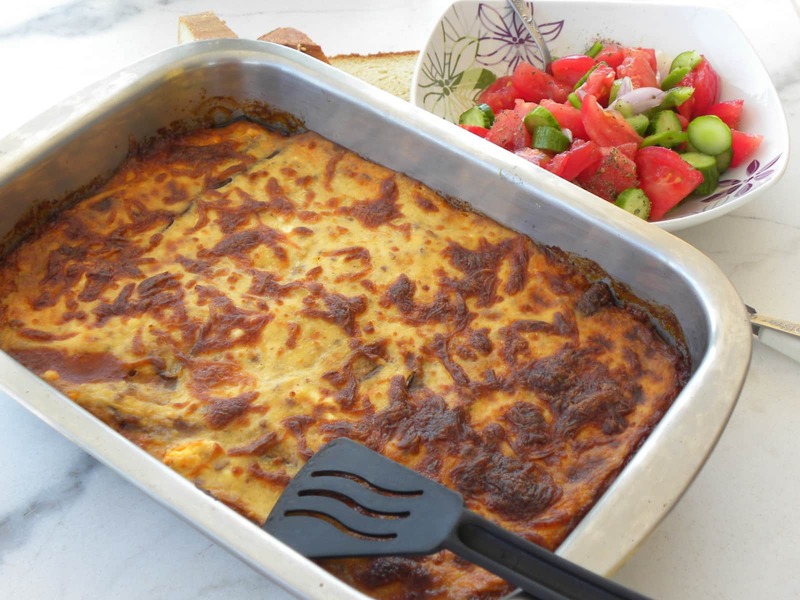 The bechamel and the ground meat are similar to moussaka but the end result is totally different. That pastitsio looks really tasty! Thank you Kevin and good luck for your turn to host. My aunt and my father still speak of the pasticcio that their Greek cook used to make. It apparently had a phyllo crust which she made herself. I love your recipe but was wondering if you ever made it with phyllo dough on top? Joumana, I know which one you are referring to. I think this is a speciality of one of our islands, I think Corfu. Unfortunately I have not made it yet.